Looking for a cool way to escape the Vegas heat? 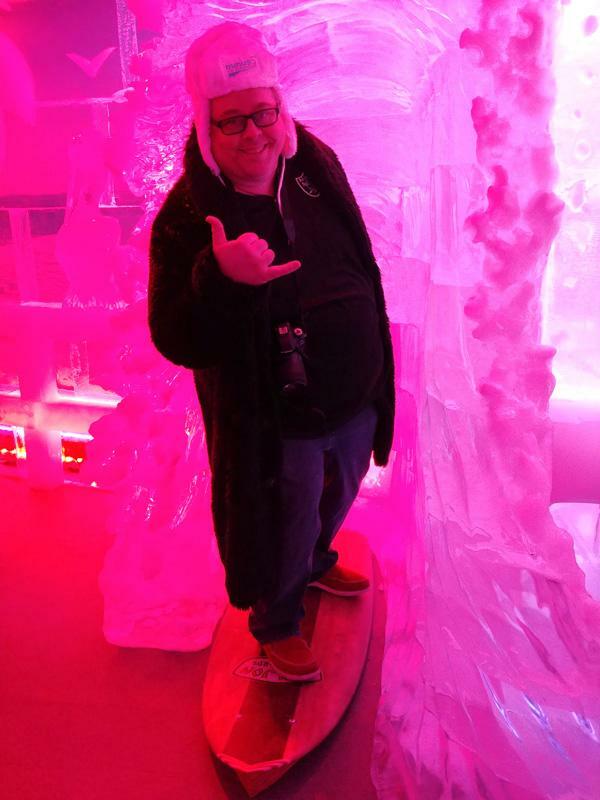 How about taking a break inside a bar that is essentially a block of ice chilled to -5 Centigrade (23 Fahrenheit) ... Combine that with parkas or fur jackets and cocktail glasses molded from ice and you have quite an experience. 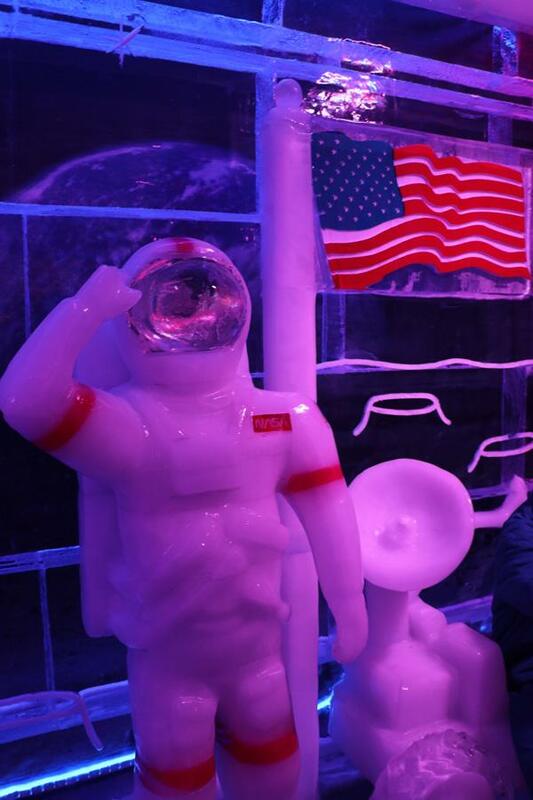 Here's what to expect when you visit the Minus5 Experience Ice Bar at Mandalay Bay. 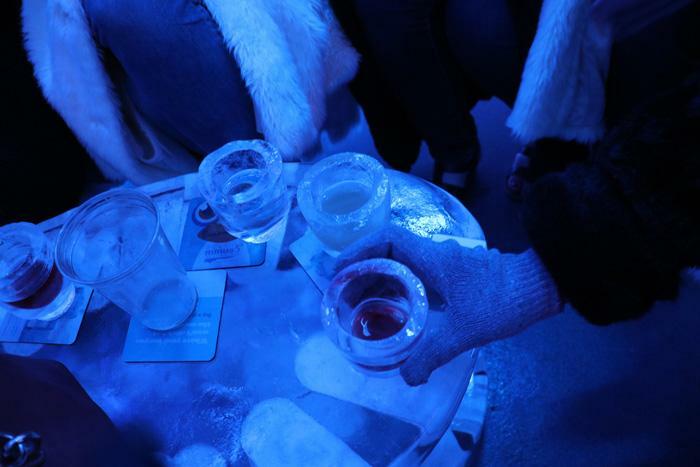 When you first arrive at Minus5 Experience Ice Bar, you are given three options for "Ice Experience" - Starting at $22, you'll get admission to the bar, parka, and gloves. At $42, you'll get the same - plus two cocktails served in a glass made of ice. Our experience was the $75 "Total VIP Experience", and included a Faux Fur Coat and souvenir hat instead of the parka. You also get a 5x7 Framed Photo that they value at "$100". All suited up, it was time to enter the cool room! As a bigger guy - wearing 4x shirts and sometimes 5x if I want baggy - I have come to expect that nobody in situations like this will have a jacket that fits. Surprisingly the guys at Minus5 not only had one, they didn't act awkward when I asked for it. In fact, after I thanked them for taking big people into consideration the lady simply remarked that they love having people of all sizes visit them. 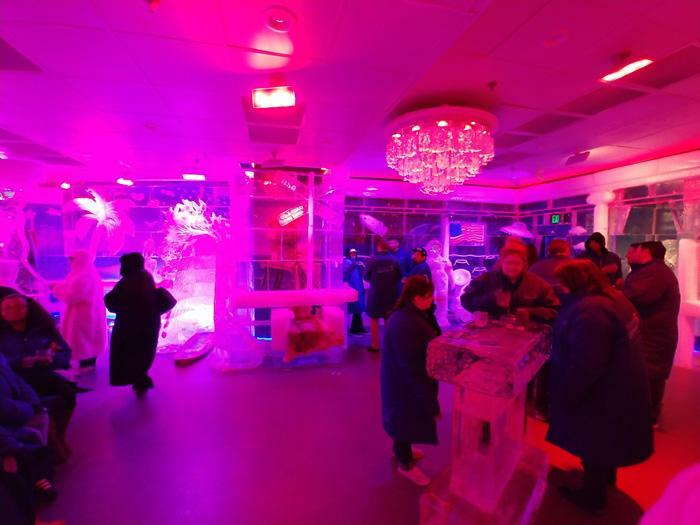 Inside the Minus5 Experience, you'll find that the entire room is made of ice from the walls to tables, and even the bar! Make sure to wear your gloves though - while 23F really isn't that uncomfortable and since there's no wind chill and they keep the humidity super low, I found the environment very nice. 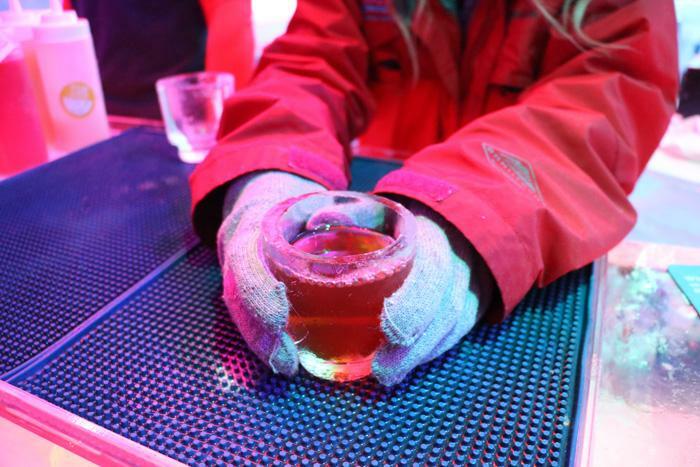 However, the gloves do help from 1) having your hands melt the glass 2) having the glass slip out of your hands. So, when they ask you to wear your gloves - don't ignore them! 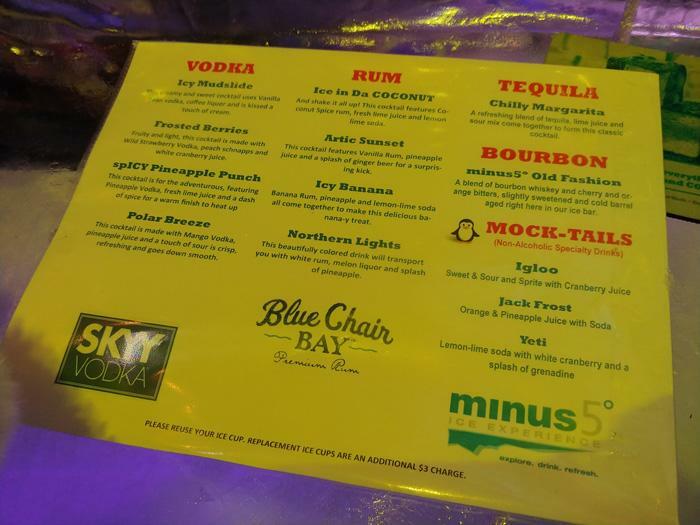 They have a pretty decent selection of drinks, including Vodka, Rum, Tequila and Bourbon cocktails as well as a few mocktails. Unfortunately, I found the two drinks I had to be not at the level that I was hoping since they were all pre-made and poured from a plastic bottle. That was disapointing, but not really unexpected. This is a kitchy gimic type bar and it's still fun. Plus, I can still say that they have the coolest drinks in town! Despite this, I'll be back again with friends and I think I'll ask them if we can just do Vodka shots instead of the cocktails. With drink in hand, it was time to explore some of the other parts of the room including this homage to Game of Thrones. 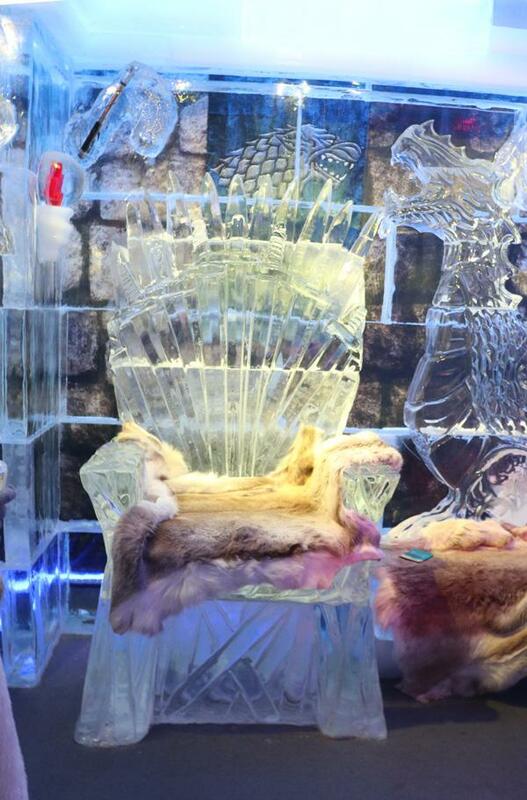 If you've ever wanted to hold court while sitting in a fur-lined throne of ice guarded by a dragon, then this is your chance! Or maybe your style is to hang out with astronauts? They've got that too. I really liked how there were plenty of selfie spots spread out across the room. While the room itself isn't that big, it's capacity controlled so it doesn't feel crowded. 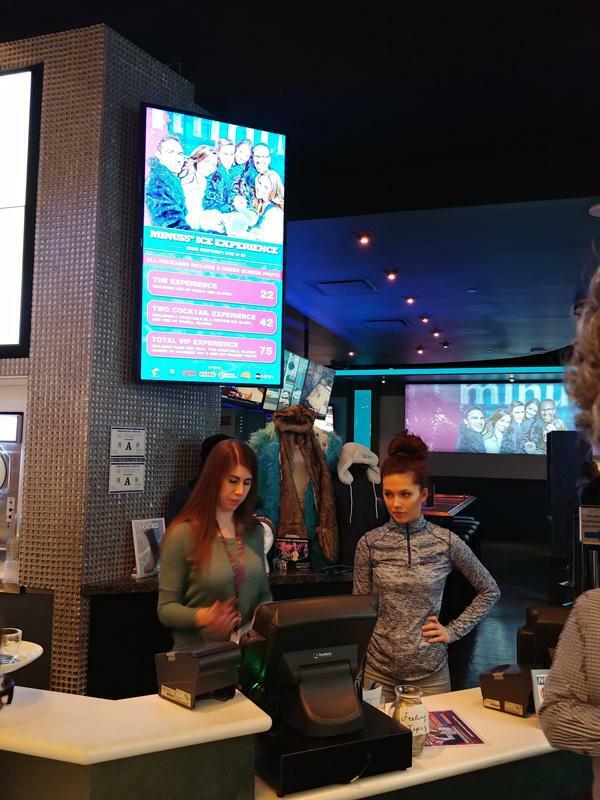 Minus5 Experience Ice Bar does have a reservation system similar to a restuarnat, so if you are planning to visit during peak times or with a large group, it's a good idea to make a reservation online. Also, while we visited as part of a press group, normally you will not be allowed to take cameras into the Minus5 Experience. This is to prevent damage (if you lay your phone on the ice it can damage it) and I suspect also to encourage you to purchase the photos afterwards from their official photographer.